The word massacre denotes a form of collective action that destroys the defenceless individuals. In European middle ages, the word has been used in reference to animals. There is a difference between massacre and genocide. Every massacre is not a genocide, a genocide is primarily composed of one or more massacres. There are many categories of massacre like local (face to face), bilateral (civil wars), unilateral (State against its people) and mass massacre that occurred in Indonesia in 1965 and Rwanda in 1994 (Se´melin, 2001, from massacre to the genocidal process). Talking about the Kashmir valley, the valley witnessed a numerous massacres right from 1947. The massacre of Muslim in Jammu region remained secret and there is no official figure of death toll. The large number of killings occurred in Udhampur, Kathua and Reasi areas of Jammu province. It has argued that Right Wing Hindu party RSS played a key role in Jammu massacre, who were aided by armed Sikh-Hindu refugees of Mirpur and Kotli (Naqvi, 2016). Village after village were burned, ethnically cleansed, thousands were displaced and women were raped and abducted. This massacre laid the foundation of colonial regime in Kashmir and a sudden demographic change occurred in the Jammu region. From 1947 to 1990, the years remain age of conflict, certain up’s and down’s in the administration, wars and agreements, stolen of holy relic, Islamization, influence of soviet-Afghanistan war, rigid elections which all became the factors for insurgency. The early years of 1990, daily life was a routine of crackdowns, curfews, mass arrests. Indiscriminate firing from Army and police on demonstrators. These were the years of the forgotten massacres seared in Kashmiri memory, but forgotten by the rest of the world. There were other events like exodus of Kashmiri pundits that also occurred in the same era, which is debated and discussed in every corner of the world. It is true that this phase was the darkest phase of Kashmir history as well as blot on the Kashmiriyat. But it is also unfortunate that a day after the exodus of Kashmir pundits, what happened in the valley. The questions arises, was it already planned or it happened immediately. The displacement of Kashmiri pundits occurred on 19th January 1990 and next day, the Governor of Kashmir Jagmohan ordered his troops to open indiscriminate firing on defenceless people. From 20-25th January three massacres occurred within no time. The first one was Gaw Kadal massacre in which around 53 were killed and thousands were injured. 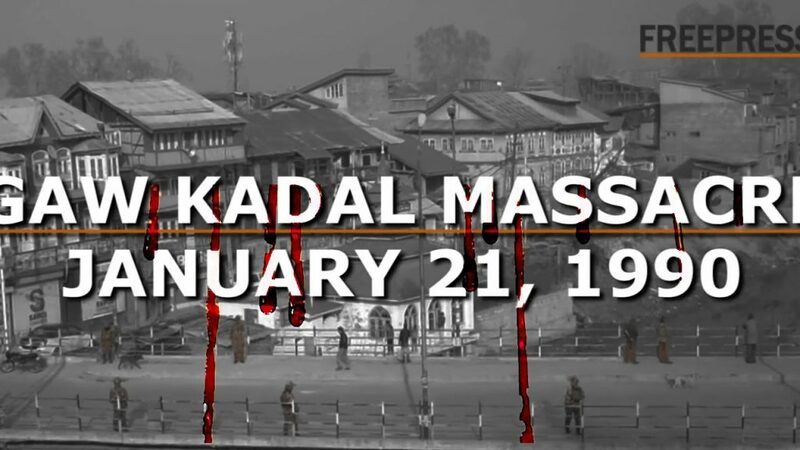 It was 21st January 1990, when the news broke out that some women at Chota Bazar locality of downtown Srinagar were molested during the nocturnal crackdown on the intervening night of 20th January. As soon as the news spread, the people from the surrounding areas came out from their homes and started protests against it. As per witnesses, the demonstration turned massive and protestors decided to move towards downtown through Gaw Kadal Bridge. When the procession reached near the bridge, the governor Jagmohan already deployed security persons there, who restored indiscriminate firing leaving scores dead and many injured. As per official data, over 53 people were killed, while over 200 were injured. The matter was being investigated by the police under FIR (3/1990), but when a compliant was again filed in 2012 by state human rights commission and police revealed that there are shortcomings in the investigation. The massacre is shocking as well as serious in many ways. It raises the question why rule of law is puppet before power and why from 29, the matter is still under investigation and when justice should be provided to the families of the victims. This massacre shook the conscience of the people as it was the turning point in the valley. After that, the people became more rebellious ever than before. This massacre imprinted the people’s mind especially younger generation of the time. Despite passing 29 years, justice continues to elude victim’s families of Gaw Kadal massacre as no action has been taken against the accused government forces.